Few days back we alerted about the glitches twitter solving in terms of Twitter lists & Tweet counts. Though it managed to solve those glitches within a couple of days. It’s certainly aiming to be at par with Facebook. It was @ 13th Rank 3-4 months back in the Alexa rank, & now it is @ 12th rank. 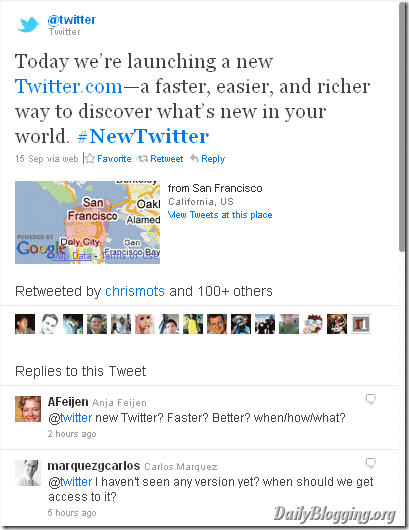 With the increasing use of 3rd Party applications which run on Twitter’s API like TweetDeck, HootSuite5, CoTweet, etc. 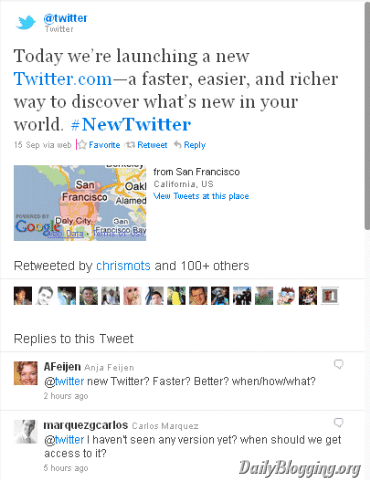 ; Twitter is putting in all it’s efforts to regain people’s trust on the Twitter web version. With this new design it’s certainly going to achieve that as the new version looks quite promising & more importantly, IT IS promising. So lets take a look at what all new things have been incorporated in the new twitter design. 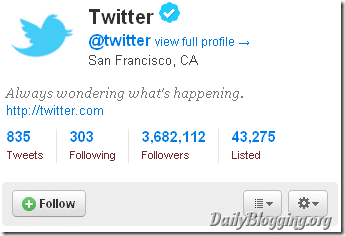 Previously we used to have the ‘t’ in the favicon of Twitter. Now, it’s the twitter bird which has replaced the ‘t’. So a sort of rebranding of the Twitter logo has taken place. Also the logo which had a stroke effect around twitter is now a stroke less but filled with a whitish-grey gradient which gives it a shiny effect. 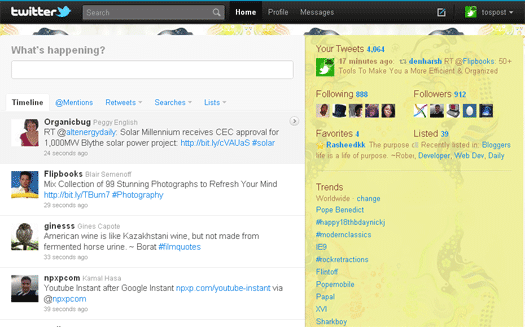 The new Twitter is focused on a minimalistic design which gives it a unique look. It has taken care of the arrangement of various information in a small space. The image I have inserted above is a smaller version (in terms of size). 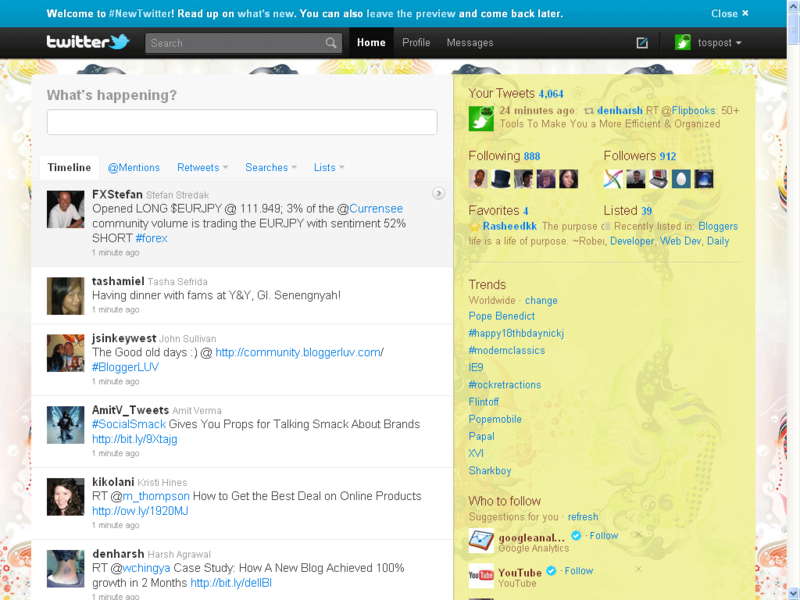 Take a look at the full version image of the new twitter design. Personally, I loved the new design. It’s way of arranging things impresses me. This time it has added special hover effects using the power of CSS & in some cases modern CSS codes like the text-shadow. If you’re using an older version of IE, then you may not be able to see those changes. It’s better you upgrade to IE9 as it’s released today. Now forget the MORE button at the footer section of Twitter. It’s now replaced by Infinite Scrolling. Infinite Scrolling will scroll to the next page as soon as you approach the footer area. In other words, there is no footer section now. The links & copyright of Twitter have been shifted to the wider Sidebar. Previously we had the Hovercards, which used to perform this function. Now it’s replaced by Mini Profiles. It loads the profile information as soon as you click on a profile link. This indeed saves a lot of time. To know more about these features, check out their official video from YouTube. You can also follow them @twitter & catch the latest updates on the new twitter on their standalone page called New Twitter. 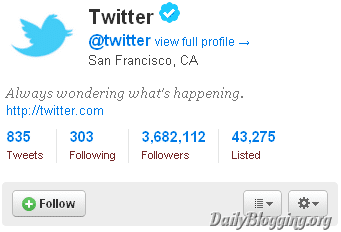 Do you think this “New Twitter” would leave behind the third-party apps & regain its control again ? You have missed the videos and pictures part. Now with the new twitter we can tweet videos and pictures and we can watch them there without getting out of the twitter site. My Twitter page is still showing old style only 🙁 any reason buddy?? Well as I said in the (NOTE) it’s rolled out for only few people & not all. I’m still waiting to see New twitter design for my Twitter account..
New design is more promising and I’m sure it will increase the no. 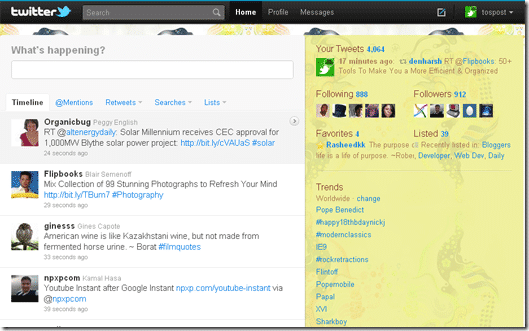 of users for web interface of official Twitter client.. Helpful and excellent stuff you have here. Keep posting! I am always looking to learn on that topic. I’ve seen and explore the new twitter. Wow it is really fantastic!